Talking about armpits is not something anyone wants to do – agree? My 11 year old would tell you the same thing. Armpits are stinky, and nowhere near as attractive as talking about our breasts, or our beautiful faces… not to mention they are the stinky part of the body that most of us wish we didn’t have to deal with. Wait… sometimes we don’t even want to talk about our faces, at least I don’t. Armpit smells are nasty, and stains? Even worse to deal with. Most people take the easy route, and cover up the sweaty pits with deodorants or antiperspirants that stop the smell and even the sweat. However… to cover up what your body does naturally isn’t always the best option. I just had this discussion with my 11 year old yesterday. Talking about armpits and armpit smells in a house of 5 kids is comical ~ normal, and pretty much accepted. If anything, it gets us away from talking about butts, butts, and more butts. Because face it, boys love to talk about that part of the body all. the. time. Lets talk about sweat – shall we? Sweat is a completely normal bodily function – it allows the body to cool down and remove toxins from the body. By blocking your body’s ability to sweat, you are also blocking the body’s natural route to remove toxins. In other words, you need to sweat. Your body needs to get rid of what is building up in side – unfortunately society wants to dictate that sweating is a bad thing and has perceived us to believe that it is not acceptable. Instead, people turn to antiperspirant deodorants that contain aluminum based ingredients – they form a plug in your sweat ducts, that stop the flow of sweat to your surface. [like we said, sweating is normal!] They allow your body to prevent the smell of body odor and sweat through these aluminum based compounds. Applied often on the skin near the breast, they are absorbed by the skin and cause estrogen like (hormonal) effects. These compounds mimic estrogen, and can affect your hormones – which leads to heavy periods, early menstrual cycles, painful periods, and much more. Estrogen has the ability to promote the growth of breast cancer cells, it has been suggested that these compounds can contribute to the development of breast cancer. Why continue to use these items? In most cases, we use items because they are used in mass – when mainstream America uses them, we never sop to question their impact on our health. They are heavily marketed, promoted on social media, subsidized by our government and also promoted widely on television. Do you question what you use? Or do you just use it because everyone else does and you don’t know anything else? I don’t care what others do … that’s clearly evident. If I did, we’d be swimming in lucky charms, bathing in fruit loops and washing our clothes in capri suns. Stop to think about it though – why would you want to stop your body from sweating? If your skin is the largest organ in your body, and we stop the sweat glands from doing what they were created to do , then we are, essentially, holding in the toxins by preventing them from flowing freely. 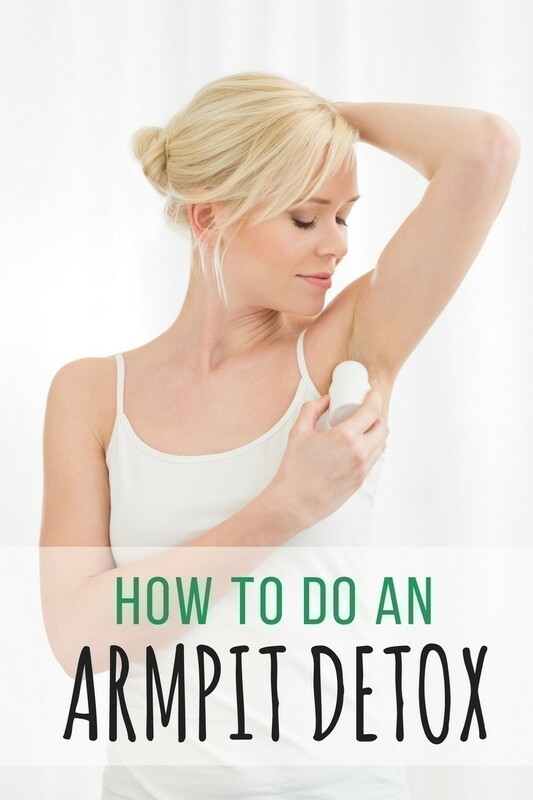 An armpit detox is one of many ways you can reduce sweat and smell less – and is a very important part of self care, especially if you are making a move to natural deodorant or DIY varieties. You need to detox before you take the natural deodorant route, because you need to purge what’s lurking underneath, for the DIY varieties to work effectively. Mix those ingredients together in a plastic or glass bowl (not metal) and spread a thin layer over your arms. Allow to sit 5-15 minutes, and work up to a longer period of time. Wash off in the shower or with a warm washcloth. Repeat daily (4-5 days if not up to a week), until your natural deodorant is non irritating. PLUS, see over 25 DIY’s with Essential Oils!